The former minister of agriculture Victoria Sekitoleko hopes her community library stacked with Chinese books will inspire young Ugandans. Zhao Yanrong reports in Kampala. It's a typical downtown Kampala scene with crowds shifting between businesses - a clothing store, a furniture shop and a hair salon with loud music blasting through its doors onto the street. But above the bustle, on the second floor of a building, is a very un-Kampala picture that might seem more at home in the center of Beijing - a quiet corner of a community library stacked with Chinese literature, where green tea is served from a teapot emblazoned with a dragon. The shelves are full of books from or about China, covering everything from children's stories to history and a thesis on the progress of Chinese urbanization. Victoria Sekitoleko, the owner of the library, likes to spend time here sharing her Chinese experience with young Ugandans. Sekitoleko is Uganda's former minister of agriculture. She spent five years in Beijing as a representative of the United Nations Food and Agriculture Organization in China, Mongolia and South Korea from 2005 to 2011. 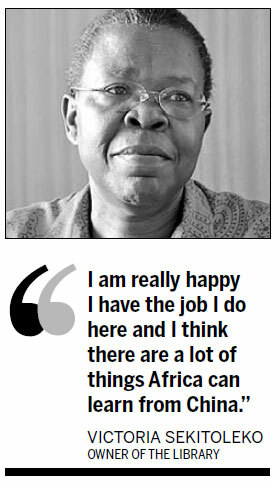 "I am really happy I have the job I do here, and I think there are a lot of things Africa can learn from China," the 61-year-old says. She says she is impressed by China's ability to feed its 1.3 billion people while many African countries rely on donations from Europe, which itself is struggling economically. "We have the best soil and land resources in the world, and we should at least meet the minimum requirement of feeding ourselves. "When we cannot fully rely on food assistance from the outside. Africa should wake up and try to support ourselves like China does," she says, adding that she expects Uganda will be able to not only feed itself but also begin exporting food with the help of China. About 20 percent of Uganda is covered by water, which means the country's fishing and aqua-farming industries have huge potential. China is investing heavily in these areas to develop the agricultural economy. A Chinese company opened a fish farming demonstration center costing $5 million under an agreement from the Forum on China Africa Cooperation. At the center, located on the outskirts of Kampala, local farmers are trained in modern ways of fish farming using simple and affordable technology. Fish experts from across the East Africa region also visit the center to share knowledge on best practices. The former minister of agriculture believes learning practical and affordable Chinese agriculture methods will benefit Uganda more than direct material support. "Different from our traditional partners, like the European countries, Chinese companies want to listen to us and put our requirements as the priority of our cooperation," she says. She quotes the saying: "Give a man a fish and you feed him for a day. Teach a man to fish and you feed him for a lifetime." She believes this is the way forward for Uganda's agriculture. Introducing Chinese culture and philosophy to Uganda through the community library is a good way of inspiring Ugandans to learn from China, Sekitoleko believes. Weekly Chinese classes are held in the library, and table tennis tables are set up for the waiting parents to use. Sekitoleko also provides information on Chinese university scholarships for young Ugandans interested in studying abroad. She also runs a Chinese culture center in Kampala, where she exhibits Chinese art and products. Sekitoleko made many Chinese friends during her five years in Beijing. Although she retired from the United Nations Food and Agriculture Organization in 2011, she still returns to China twice a year. When Ugandans complain about the poor quality of Chinese goods, Sekitoleko says she tries to find a better quality alternative from China. "In fact, it's just because they purchased low-end Chinese goods from irresponsible traders. I want to help them to know the real value of products made in China and build their confidence in Chinese businesses," she says. On one occasion, Sekitoleko recalls, she advised a Ugandan businessman on where to buy food processors in China. He planned to go to the Canton Fair in Guangzhou, but she suggested he could find a better deal in Zhengzhou, the capital city of Henan province, where there is the biggest food processing equipment base in China. "People from Uganda have a strong desire to know about China, but we don't have many places that provide a lot of information," Sekitoleko says. "When people come to me for advice, I want to try to help and that makes my knowledge and experience in China valuable." Contact the writer at zhaoyanrong@chinadaily.com.cn.